There are dozens of Internet sites out there that reveal how much your home is worth. 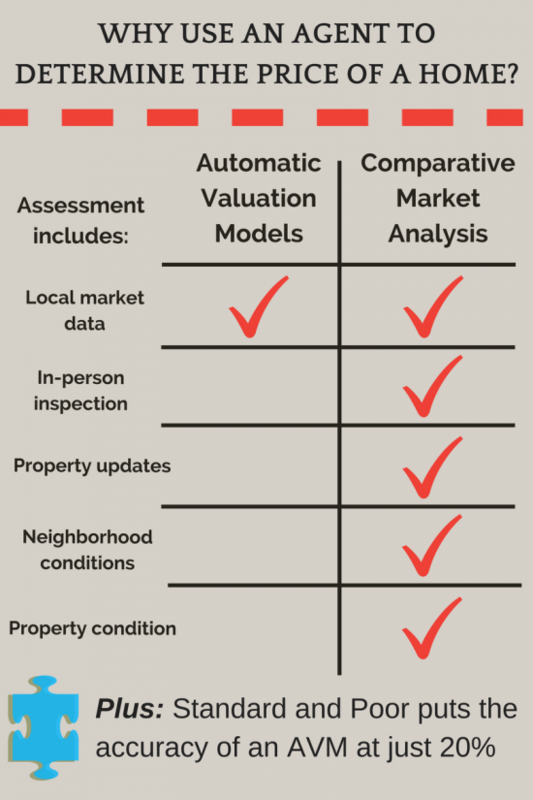 They are called “automated valuation model” (AVM) sites, which use statistical modeling techniques that calculate the property value by comparing it with similar-sized homes that have recently sold in your area. These tools crunch their data with publicly available numbers from several listing services and combine them with regional trends to set a sale price for your property. Cool, right? Now, here is the question that every seller asks themselves: Do I still need a real estate agent to help me through this “assessment” process? Well, there is a reason for the existence of a real estate agent; actually, I should say there are several reasons why these professionals are so important in any real estate transaction. May I dare to list these reasons? Although most Realtors also use these tools to start a customer’s property evaluation, a lot of groundwork is done after the results are revealed. Most AVMs confirm their evaluations may be off by around 5 percent. Well, actually they are sometimes inaccurate by up to 20 percent, according to a study by Standard & Poor’s (one of the reasons being that old data is being used, especially in a fast-moving market). This means that anyone strictly guided by these calculations can be way higher or under market and consequently be losing either money or possible buyers. Several pieces of information compose the valuation range of a property. Market data is only one of them. The rest is very property-specific, such as whether you have made upgrades or whether your roof is too old — just to name a couple. Other factors include where your property is located and whether it’s desirable for potential buyers. For example: Is the neighborhood safe? Are there good schools around the area? If I need to go shopping, can I just walk or do I have to drive a long way? The AVM tools cannot simply “know” these things. Real estate agents are trained to do a comparative market analysis, or a “CMA,” as we call it, for every property they list for sale. This includes going to the property and literally inspecting the home, the neighborhood, everything that will help pin down the ideal listing price range. But mostly, this will give the Realtor the ability to also “articulate” to potential buyers how the selling price is the right price. Preparing a CMA is an art, not a science, I will dare to say. There’s no one size fits all. Well-thought-out CMAs need deep knowledge of the dynamics of property sales in a given neighborhood. The Realtor makes judgments based on their understanding of the local market and the dozens of peculiarities that affect price, such as lot size; lot orientation; tax-assessed value; and features of the lot, including its terrain, access and privacy, improvements and additions, condition, quality and age. For example, your agent may know that an overextended home, the appearance of which is out of step with the neighborhood, will likely sell at a discount: An AVM will count only its square footage, and come up with a valuation that’s too high. Every home is unique and must be valued accordingly. Get it wrong and you risk deterring buyers, or not getting the money you deserve on a sale. If you are in the market to buy (or sell) a home in Northern California, Realtors associated with Century 21 M&M look forward to walking you through the process. Rest assured that Century 21 M&M Realtors will do their best to make sure that both Buyers and Sellers are protected during the transaction.